8585 S. Staples, Corpus Christi. Join us this Tuesday, April 2nd, when Jace Tunnell, Director of Mission-Aransas National Estuaries Research reserve shares his presentation about the citizen science project looking at the distribution and increase awareness of nurdles along the Gulf of Mexico. Come listen to hear how you can participate in this projects. CBAS Monthly Meeting: There Be Whales in the Gulf of Mexico - Who Knew? Join us this Tuesday, March 6th, when Neil Larry McKinney PhD, the Senior Executive Director of the Harte Research Institute of the Gulf of Mexico shares his presentation titled “There Be Whales in the Gulf of Mexico - Who Knew?”. Join us this Tuesday, February 5th, when Neil McQueen, the Vice Chair of the Texas Coastal Bend Chapter, Surfrider Foundation, shares his presentation titled “Plastic Pollution in the Ocean- How Bad Is It and What Can We Do to Fix It”, where he will discuss the issue of plastic pollution that plagues our oceans. Join us this Tuesday, December 4th, when Chase Walther, a Masters candidate student from he Caeser Kleberg Wildlife Research Institute, shares his presentation titled “Invasive Grasses, Grazing Management, and their Impacts on Grassland Bird Habitat”, where he will discuss how management practices impact bird habitat. Situated in the center of the Rio Grande Valley, Harlingen is the ideal location to venture from for excellent birding. Within 90 minutes are dry, desert habitats to the far west, and the coastal habitats are less than 60 minutes to the east, with a riparian ribbon along the entire southern boundary (AKA the Rio Grande River) and vast ranch land to the north. For 24 years running, the Rio Grande Valley Birding Festival has provided thousands of birders with life birds, those we call the “RGV Specialties”. Professional tour guides lead every trip, whether bus or van, with a low participant-to-guide ratio to provide excellent spotting and identification. Over 60 vendors of bird-related products can delight every level of birder at the Birders Bazaar, and their contributions to the Silent Auction make that event very inviting. We offer great birds, excellent guiding, educational seminars, rousing socials and FUN! Ask anybody who has been here before! Come volunteer to help clean up our area rookery islands! Every year the Coastal Bend Bays & Estuaries Program along with Doc's Seafood and steaks, Texas Parks & Wildlife, US Fish & Wildlife Service, the TX General Land Office, and others, hosts a cleanup to remove fishing line, plastic, and other harmful trash from islands in the Laguna Madre where birds like herons, egrets, pelicans, and skimmers nest and raise their young. The event will be on Saturday, October 20th, from 9 AM - 12 PM, at Doc's Seafood & Steaks. Please bring appropriate clothing for being in the sun, shoes and pants that can get wet and muddy (you may have to wade through knee-deep water), and re-usable water bottle. After all, we don't want to create more plastic trash at a trash cleanup! After a couple of hours of cleanup, we are all treated to a free hot dog lunch! HOW MANY BIRDS CAN YOU FIND? On October 6th, Coastal Bend Audubon Society is hosting its annual Big Day event at Harte Research Institute. The Big Day is a great event for birders of all skill levels to get together and enjoy a day of birding. This is also a great opportunity to learn birds, or teach someone who is interesting in learning birds. During the Big Day, teams of 3 to 5 people go out and record the number of different birds seen throughout the day. The intent is for people to gather friends and family and enjoy the birds in Texas. To participate register a team of 3 to 5 people. Throughout the day record each species you find. After, join CBAS and the other teams at the Harte Research Institute at 6:00 pm for dinner, and a silent auction. To sign up download the registration form and submit by October 2nd. Register by September 21 and save! Early birds help us better plan the number of meals and t-shirts to provide. Register after but through our October 2 meeting and pay a little extra ($5/registrant), but you're still good. While there may be some friendly competition, everyone who participates is a winner and a hero to CBAS and the birds. Big Day income helps us continue to have meetings and a meeting place, provide refreshments, give out graduate student research awards, support worthy projects like the new bird blind at Lake Corpus Christi State Park, keep our sanctuary mowed and hooked-up with water, maintain a website, keep a bank account and PO box, and support our field trips, and more. And since Hurricane Harvey, last fall, we have been able to donate to Port Aransas Nature Preserves and the Amos Rehabilitation Keep (ARK) at The University of Texas Marine Science Center. Not interested in team birding on Big Day? How about attending the evening event and making it a Big Night? We're flexible. How else can you be involved? Donate a silent auction item or two. The majority of our items are valued at less than $75 and most under $50. Most items are nature related. We can accept silent auction items at the September 4 and October 2 meetings or email Paula (address in newsletter) if you need to make other arrangements. Bid on a silent auction item. Help get those bids up and maybe win something cool. Big Day shirts will be available before the event, so wear your Big Day t-shirt while you're out and to the dinner. Wear your Big Day t-shirt throughout the year. They usually draw a lot of attention with their cool designs. This year's shirt is no exception with a beautiful Vermilion Flycatcher designed by artist, Jason Hovey. Join us this Tuesday, October 2, when Robbie Merritt, the superintendent of Lake Corpus Christi State Park, shares his presentation titled “Expanding the Mission”, where he will discuss how a traditional park can reach an increasingly urbanized population. What will this migration bring? We will focus on shorebirds and hawks. We will meet Gene on the morning of Saturday, September 29, at Tule Lake and we'll move on from there. Moderate walking is required. We will wrap up with lunch around 1: 00 pm. CBAS Educational trips are free to CBAS members but require reservations. Participation is limited to twelve people to ensure educational opportunity is at its best. To make your reservation, please email Barb at - brownpelicanrap@yahoo.com and include your phone number. If you are not a current member of either Coastal Bend Audubon Society or National Audubon Society, there is a printable membership form online. If you should need to join or renew membership before this trip, please send your membership to the local Corpus Christi mailing address printed on the form or bring the form with you and turn it in to Gene on the day of the trip. This year the HummerBird Celebration will feature over 75 vendors more than 14 speakers and a variety of nature inspired field trips on land and sea. The Celebration is fun, educational and inspiring. It is designed for those who enjoy bird watching as well as those who follow the migration patterns. If you enjoy nature, birds or some aspect of them, then this event is for you. Visit the HummerBird website for more information on speakers, tours, vendors, and tickets. World Shorebird Day is an event that celebrates shorebirds, and raises awareness of the importance of protecting bird populations and their habitats. During this event participants will meet at Mollie Beatty, then we will drive to multiple sites around the Corpus Christi area counting and observing different species shorebirds. We will also learn about important migration and wintering habitats along the coastal bend. important migration and wintering habitats along the Coastal Bend. Join us this Tuesday, September 4, when Dr. April A. Conkey, Assistant Professor and Research Scientist at Caesar Kleberg Wildlife Research Institute, Texas A&M--Kingsville, shares her presentation for the upcoming annual conference of The Wildlife Society this October in Cleveland, Ohio--"When Worlds Collide: Bird-window Mortality on a Continental Scale." Hear from from Dr. Conkey regarding the challenges birds face from reflective windows and results from recent local campus collision surveys. Whooping Crane Festival 2018 is ON! Make plans to attend the 22nd Annual Whooping Crane Festival in Port Aransas, Texas on February 22-25, 2018 (Hurricane Harvey can’t keep us down!). This is expected to be a record winter for Whooping Cranes in the Coastal Bend – you won’t want to miss this year’s festival. Come join us as we welcome William Colson, a Doctoral candidate at the Caesar Kleberg Wildlife Research Institute at Texas A&M University-Kingsville, as he shares his presentation, "Conservation Photographers: Photography contests, birding, and education outreach." 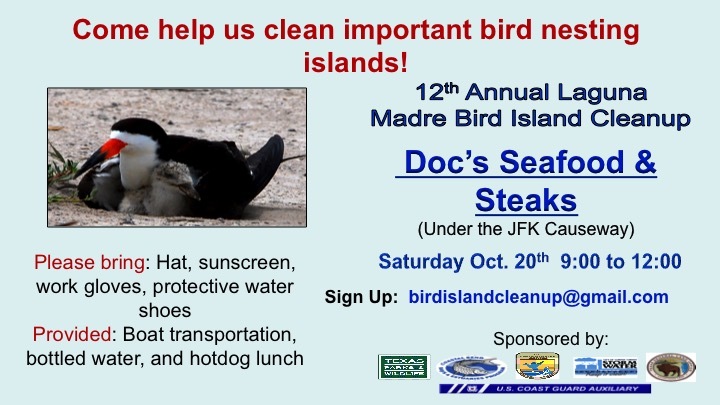 Come help clean up our bird islands! Wednesday, October 11, 2017, join Gene for a hike through Carmel Hills along the shores of Lake Corpus Christi for a chance to see raptors, shorebirds, passerines and more! "Bringing the Outside IN: Wild Birds in the 6th & 7th Grade Classroom"
Caesar Kleberg Wildlife Research Institute at Texas A&M University-Kingsville. Come join us! The Coastal Bend Audubon Society will hold its annual Officer Election Meeting at the B&J's Pizza at 6335 SPID, on Tuesday, August 8th, at 7:00 PM. Every year, the 4 officer positions – President, VP, Secretary, and Treasurer- at CBAS are elected by the membership. Anyone is allowed to run and elections will take place during the meeting on July 5th. President - The president serves as president of the society, chairman of the Board, and serves as an ex-officio member of all committees. The president also performs all other duties associated with the position. Vice-president - The vice-president assists the president in the carrying out of duties and serves in the place of the president if the president is absent from meetings. .
Secretary - The secretary keeps records of all proceedings at chapter meetings and keeps records of all chapter correspondence. Treasurer - The treasurer has custody of the chapter's funds and disburses the funds as ordered by the Board. The treasurer also compiles regular financial reports for the board and an annual report for National/Texas Audubon. If you would like to send in a nomination for an officer position, please email coastalbendaudubon@gmail.com, however, last-minute nominations are welcome at the Election Meeting up until voting commences. Development/Fundraising – Need help organizing and planning fundraising events like our annual Big Day Event. Education – Need help building and developing our education component to more effectively reach out to the public and our youth. Field Trip - We are always looking for more help in this department as far as organizing and conducting field trips/bird walks. Sanctuary – Need help with the management and promotion of our North Bay Sanctuary. Media/PR – If you are skilled in the arts of social media, IT services, etc., the expertise would be highly beneficial. General – Need general help with various committees and initiatives throughout the year. The Coastal Bend Audubon Society is a member-driven organization, so if you have ideas on how to better the Society or have a particular direction or initiative you would like to see the club move forward with, get involved! Please come vote for the CBAS officers for the upcoming year! If you have any questions about the election, how to volunteer for the Coastal Bend Audubon Society, or would like to nominate someone for a position please email Owen Fitzsimmons at coastalbendaudubon@gmail.com. Come join us as we welcome guest speaker, Jace Tunnell! Jace is Director of the Mission-Aransas National Estuarine Research Reserve and will be presenting on his work as a weekend archaeologist, with the title, "Coastal Bend Archeological Discovery....in my family's garage!" Come join field trip leader, Gene Blacklock, and visit the spring migration hotspots of the Coastal Bend. The trip begins at Packery Channel Park, out on the island. This trip is considered moderate. Walking is required. For more details or to sign up, contact Barbara Rapstein at barbraps@rocketmail.com. This field trip is free for Audubon members. Non-members must pay the cost of an annual membership ($15 for CBAS or $20 for National Audubon) to be eligible to attend. If unsure of membership status, contact us at coastalbendaudubon@gmail.com. Come join us as we welcome guest speaker, Dr. Selma Glasscock! Dr. Glasscock is the Assistant Director of the Welder Wildlife Foundation and will be presenting some of her work monitoring avian productivity and survival on the Welder Wildlife Refuge. Come out and help spruce up the Sanctuary! Come join field trip leader, Gene Blacklock, and explore the birds of Medio Creek Ranch, a private ranch located in Bee County. This trip is considered moderate difficulty, walking is required. Come join us as we welcome guest speaker, Emily Wells! Emily, a Master's student at Texas A&M University-Kingsville and 2016 recipient of our CBAS Conservation Award, will present some of her recent research on Sandhill Cranes!